Jill Marie McIlroy: 1947 -2007. Universally loved and in a better place. Rest in peace Mom. Crude Oil traded sideways last week closing $0.40 lower on the week at $88.28. This morning oil is trading back up above $89.50 in a volatile early session. Natural Gas fell 2% to close at $7.155 last week. This morning gas is trading off $0.10 to $0.15 to nearly breach $7. Last Week: 198 gas weighted degree days vs 172 in the prior week. The expectation had been 180. This is a pretty tough comp week for gas as we're going up against a degree day tally of 212 in the year ago week. Those 212 degree days drove a whopping 146 Bcf withdrawal last year which we won't match so part of the large contraction we saw in the YoY surplus will be reversed this week. "AN AREA OF SHOWERS AND THUNDERSTORMS HAS BECOME BETTER ORGANIZED TODAY (Sunday) ABOUT 550 MILES EAST-NORTHEAST OF PUERTO RICO... IN ASSOCIATION WITH A SHARP SURFACE TROUGH AND A LARGE UPPER-LEVEL LOW. THE SYSTEM IS ALREADY PRODUCING GALE FORCE WINDS...MAINLY TO THE NORTH AND NORTHEAST OF THE MAIN AREA OF THUNDERSTORMS. THIS SYSTEM HAS THE POTENTIAL TO BECOME A TROPICAL OR SUBTROPICAL STORM DURING THE NEXT 24 HOURS... AND INTERESTS IN THE NORTHERN LEEWARD ISLANDS... THE VIRGIN ISLANDS... PUERTO RICO... HISPANIOLA... AND THE EASTERN BAHAMAS SHOULD MONITOR THE PROGRESS OF THIS SYSTEM." To check out the weekend wrap click here. In the wrap find some comments on energy sector performance, crack spreads, gas price metrics. NY Times On Oil Watch: Very interesting article ran over the weekend regarding the increased consumption of oil by the nations that actually produce it! Worth a read here as it spells out a pretty bullish case for oil over the next 2 to 3 years...even mentions the very real possibility that Mexico, #2 on the list of places the U.S. gets its oil now, may flip to net importer status in the next five years, a result of increased per capita domestic consumption and declining production. Holdings Watch: - click here for an updated holdings list. Service Stocks: last week first (CVX) and (COP) indicated they will grow their already massive capital budgets in 2008 by double digit percents (15% and 13% respectively). This money will in large part go to the service companies. Service companies are somewhat like brokers in that they win whether client strikes it rich or not. The most straightforward beneficiaries will be household names like SLB and (HAL) (which we hold now), deepwater drillers (again holding (DO) and in and out of (RIG)) all the way down to names like (CLB) which will take a look at over 50 miles of oil sand cores next year. Can XOM be left out of the double digit spending growth boom? Not likely. E&P Capital Expenditure Survey: Lehman Brother's annual capex survey indicates spending is set to rise 11% in 2008 which would mark the sixth year of double digit percentage spending growth from the producers. The survey specifically cited demand from the deepwater basins of the globe as driving growth. That's a big shout out to (DO) and (RIG) as well as ROV leader and all around subsea expert (OII). "We believe the management changes announced at Halliburton do not have anything to do with performance-related issues and we do not expect a negative earnings surprise or write off ahead," Lehman Brothers analyst James Crandell said in a note to clients, Reuters reported. "Rather, we think they have more to do with setting up current chief financial officer Cris Gaut as the potential successor to chief executive Dave Lesar down the road." Zcomment: put that together with the rising CAPEX at the E&Ps and Majors and then look at HAL's 12 forward multiple relative to SLB's of 19x and you can see why I'm warming up to the name back in the mid $30s and expecting a run on $40 in the next month or so. With 2008 earnings expected to grow exactly 20% at (SLB) AND (HAL) I don't think the discount is warranted. Analyst Watch: STO to hold from buy at Deutshce, VMC picked up as a Sell at UBS (maybe a good opportunity to get long), PVA initiated at overweight at JP Morgan, (RIG) price target upped from $140 to $172 at FBR. Housekeeping Watch: By the way, I was at a friend's office over the weekend and he was asking me about the data tabs I'm always mentioning in the post. Turns out he wasn't logged in and once I showed him the to the tabs it was like watching a kid Christmas morning who just realized the "Big" stocking is theirs. You should see this in the upper left had corner of the screen. This entry was posted on Monday, December 10th, 2007 at 9:27 am	and is filed under Uncategorized. You can follow any responses to this entry through the RSS 2.0 feed. You can leave a response, or trackback from your own site. LONDON — Crude oil futures prices were mixed in London Monday amid end-of-year position taking and anticipation of Tuesday’s Federal Reserve meeting. Uncertainty over the extent of a Fed rate cut and its potential impact on the dollar hung over the market, helping to trim trading volumes and allow for erratic price moves. At 1236 GMT, the front-month January Brent contract on London’s ICE futures exchange was up 22 cents at $88.86 a barrel. The front-month January light, sweet, crude contract on the New York Mercantile Exchange was trading 12 cents higher at $88.40 a barrel. The ICE’s gasoil contract for December delivery was up $3.50 at $787.75 a metric ton, while Nymex gasoline for January delivery was down 48 points at 226.42 cents a gallon. Absent of any other fresh fundamentals news over the weekend, Tuesday’s Fed rate decision and its impact on the dollar was a focus for the crude market Monday. The Fed is expected to announce an interest rate cut amid concerns of slowing economic growth, although uncertainty surrounds how large the cut may be. “The key trading input of the week should be the decision of the Fed in regard to interest rates and the impact it will have on the dollar index and volatility of equities,” said Olivier Jakob of Petromatrix. A cheaper dollar is seen as supportive for higher crude prices, making the asset more attractive to investors holding other currencies. Lower interest rates may also help assuage current fears of an economic slowdown that could weigh on crude demand. The greenback fell slightly against the euro Monday and at 1235 GMT, the single currency fetched $1.4706. Focus on the U.S. dollar Monday highlighted the lack of other fresh news to drive crude prices, others suggested, and left prices increasingly exposed to position adjusting and increased volatility as the Christmas holidays and year-end approaches. Latest U.S. Commodities Futures Trading Commission data released Friday showed non-commercial investors had reduced their overall net long position in Nymex light, sweet crude futures in the week ended Dec. 4, a sign that many may be winding down for the year. Large speculators reduced their net long position to 47,072 on the New York Mercantile Exchange, down from 59,102 the week earlier, the CFTC reported Friday. “Recent weakness is likely related to year-end squaring of positions, players “flattening” their exposure ahead of the holidays,” said Harry Tchilinguirian, an analyst at BNP Paribas in London. But the falls in crude prices ran contrary to a prevailing fundamental backdrop of tightening supply-demand balances, he said. Beyond Tuesday’s Fed meeting, crude markets will be looking for evidence of a rebound in U.S. crude oil inventories Wednesday with the publication of the U.S. Department of Energy’s weekly inventory data. Last week’s surprise 8 million barrel draw in crude stockpiles was attributed to shipping delays resulting from fog in the Houston Shipping Channel. “Fundamentals will seek confirmation that the large draw seen last week in U.S. crude oil stocks was due to fog disruptions,” Petromatrix’s Jakob said. Z – Jill will be in our prayers as will your family. Sorry to hear about your mother-in-law. May you find strength at moments like these. Condolences to you and your family. Wow, I thought that Hurricane season was over so I have not been watching. Shear is 20 over 94L now, so slow if any development. If it does something, we should look at Christmas for land fall. No tracking at this time. Good eye Z.
do u know anything about enhanced oil recovery eorif.u ???? Thanks for the thoughts fellas. APA once again showing it’s the most leverage E&P to oil…if oil goes back into the 90s we should see a concurrent run on $105 there. Hurricane season! Who woulda thunk it?! Ky – I know a thing or two about secondary and tertiary enhance oil recovery. Is that the ticker of a company? symbol doesn’t come up. NEW YORK — Crude oil futures rose Monday as the dollar slipped ahead of Tuesday’s Federal Reserve meeting, which is expected to deliver a 25 basis-point cut in interest rates. A weakening dollar has been a big factor in crude oil’s jump close to $100 a barrel this year. The dollar’s decline has made oil futures cheaper for traders using other currencies and blunted the demand destruction tendencies of higher dollar-denominated oil prices. Light, sweet crude for January delivery on the New York Mercantile Exchange was recently up $1.25, or 1.4%, at $89.53 a barrel. Brent crude on the ICE futures exchange rose $1.05 to $89.69 a barrel. Early Monday, the euro was at $1.4716, up from $1.4655 late Friday. Oil prices were choppy last week amid low trading volumes, as the market searched for direction after a more than 10% slip from the all-time intraday high of $99.29 a barrel reached Nov. 29. The low volumes, with analysts speculating many funds have finished their trading for the year, provided for big swings in both directions on different days. Many analysts are tipping crude oil to trade near $90 a barrel until the end of the year. Traders are focussing heavily on winter demand, and sustained cold weather could provide additional gains. This is looking unlikely, however, with forecasters predicting mild winters in both Europe and the U.S. In the medium term, the U.S. National Weather Service is predicting warmer-than-normal weather from Dec. 17 to Dec. 23 in the Northeast, the world’s biggest heating oil market. Front-month January reformulated gasoline blendstock, or RBOB, rose 2.84 cents, or 1.3%, to $2.2974 a gallon. January heating oil rose 2.87 cents, or 1.2%, to $2.5334 a gallon. You are correct. Jill is in a better place. Our thoughts and prayers go out to you and your family. Ky – is it public. The big play on enhancing oil reserves is CLB – core labs . They look at core samples all over the world to help producers understand the rocks/reservoir they are drilling in and to advise them on how best to get more barrels out of the different play types. They have grown the number of times they “touch” a well over the years from one to as many as five or six. Now they are expanding this to natural gas. up, up, up and of course, I don’t own it yet, been a little leary of their chart. Bloomberg is reporting that the Houston Ship Channel is closed because of fog. Thanks RJ – it’s been very foggy all weekend across the lower third of the states. ZTRADE: Out half of my 2x position in APC Dec $60 calls for $3.00, up 67% to average cost of $1.80. yes public. since june. symbol eorif. looks like they are going to produce helium as well as oil/gas. 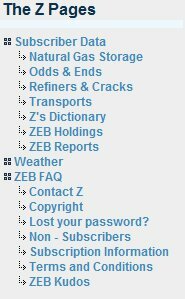 says on their webpage they are similar to denbury corp.
Ky – ok, I was going to say DNR which as you know is one of the biggest producers of CO2. Also, newby SD produces and used CO2, I think BRY in California uses some. DNR biggest I know of. Will look at EORIF but with a ticker like that…hmmmm…. crude back to flat in wild trading despite dollar weakness support. understand anything trading at $1 is very high risk. but my friend has great track record. the big ? is a close below 87???!!! Come off it. A chart point is the big question??? That is about stupid. These fair weather fans pick a direction and run with it. Demand waning, I’d like to see where he sees that. These talking head schmucks have called a top and now everything looks bad to them. Don’t bother to analyze the data, just pick out the points that you agree with and right about them using a stupid rock cliche as your header. If they had seen no action from OPEC and an 8 million barrel draw which sank the 90% of YoY storage a week ago they would have begged me to sell them barrels at $105. Oil weighted HDDs were above normal 3 out of the last 6 weeks and the other 3 weeks were a tie with normal. Versus the year ago we were colder 5 out of 6 weeks with the 6th one being a tie. That’s colder than he expected and colder than normal, not “only moderately cold” but spin away spin boy! “stunned because of a surprise 4.0 million barrel draw in crude supply.” I like how he switches from normally talking about the crude number (which fell 8 million barrels) to talking about total supply when its convenient. spin, spin, spin. he then says we will get another big draw this week for crude but that that won’t help crude because demand is waning in the US and production success is mounting in Iraq. “Major Japanese companies are now talking about using less oil. Over the weekend a few announced they would do what they could to use less. If Japan is already feeling the effect of a slowdown, can the US and China far behind?” ~~~ That’s just retarded. They’ve been talking about using less for a long time. Without job losses you won’t see a decline. China demand falling. Yeah right. Per capita consumption is on the rise from China to Nigeria to Mexico. Cheap dollar letting lots of Mexican’s buy their first car. Just retarded. WEL: somebody asked, Popeye?, last week. I came up empty on news for the rally. The hedge fund guy I met with said he thought it was noise or that perhaps a field fire somewhere had started a speculative run up. Z – Tell us how you really feel about Nicky’s buddy and the “fair weather fans”! LOL Quoting Z: “Retarded”, “Stupid”, “schmucks”. S – just call it like I see it. No agenda, No ego. No bald faced lying to pump up something I’ve been trying to liquidate or vice-versa. Should own some coal here. CLB running up. May kill off the December YGE (solar) position as I don’t trust these. My FSLR put is an abomination at this point. Trying to decide on a double or a punt. It’s a Jan put but wow, up $25 bucks from my entry…do I feel out of the loop on that or what. S – I like it, what’s that from? Oil down $0.80. What “fundamental reasons” are the talking heads and stories du jour coming up with today for the flip flop? Enough griping. Oil needs to hold $86 or they will pound it to a brief $85 test and then $80. Meanwhile, inventories will continue to fall. Where’s Nicky? Second that: Where is Nicky? S – maybe I pissed her off with the Pikey comments and talking down her boyfriend PF, lol. PF’s her boyfriend? I didn’t know that. I learn more and more on this blog. sorry to hear about Jill Z. much to young to have let alone pass away from a neurodegenerative disease. my thoughts and prayers are with your family. Thanks very much T. Just so you know I will scarce tomorrow and gone from 11 cst on. kaman try to stay inside a month when selling options, thats a long time for extraordinary things to happen. the thing is they loose more time value per day inside a month than later dated contracts. TT- I don’t have the cajones for that kind of play anyhow….yet. Zman: Thanks for taking the time to respond re Elliott Gue’s analysis. You wrote that Nat gas interest and longs are indicating a top in gas. I read in a blog that commercials are very heavily long in gas, wouldn’t that be bullish? DM – I guess I wouldn’t call it a top in gas but maybe a lid. Anyway to answer your question I’ve added some graphs to the bottom of today’s post. As you can see from the first of these charts, the net interest amongst commercial players has gotten more long. Is it bullish? Maybe. Interpreting commercial data is a bit different from the speculative realm of the non-commercials. In non-commerical (hedgie) land, you’ve got longs betting gas will go up and shorts betting it will go down. Pretty straight forward. But in commercial land, you’ve got the shorts, who are the producers of gas hedging to lock in expected gas sales at a price. They might think its going higher but they need the insurance the hedge gives them to ensure they meet their capital budget next year. The longs are the people like a couple of subs here who buy gas for large commercial real estate operations. They watch the weather and storage and don’t want to get killed by either. They hedge for a number of reasons (economy and gas fundamentals) with reason varying in proportion due to their own unique circumstance. In summary, it may be a sign that buyers are more worried about prices going higher soon I would point to Canada as a real cause of concern too but over the short term, I don’t see a correlation with gas prices (see third chart). I’ll look at a few different ways and get back to you. Is there a “burn rate” of ng for the U.S.? Ram – by burn rate do you mean how much we consume on a daily basis? Ram – let me know if that’s what you meant and I’ll put it in the post tomorrow. I gotta run some errands. Am setting an $0.80 stop on my HAL calls …I’ll be damned if I let that profit get away on that name again. Somebody occasionally post oil and ng prices if you can. thanks. see ya later. Yes, consumption rate. It’s to understand if a lay person “can do the math” by having a consumption rate and the injections or disruptions. Also, is there a “confort level” ng storage before people get nervous? Z, that was me regarding WEL. Thanks for the update. NEW YORK — Crude oil futures ended slightly lower Monday as expectations of growing U.S. crude oil and refined product inventories blocked an intraday run at $90 a barrel. The choppy trading, which saw prices rise as high as $89.80 a barrel as the dollar slumped in early trading, kept prices in the settlement range between $87.49 and $90.23 they have been in all this month. Light, sweet crude for January delivery on the New York Mercantile Exchange settled 42 cents, or 0.5%, lower at $87.86 a barrel. Brent crude on the ICE futures exchange fell 35 cents to $88.29 a barrel. Settlement prices for Brent weren’t yet available. U.S. crude inventories are seen building by 100,000 barrels in data due Wednesday from the Department of Energy, according to the mean forecast in a Dow Jones Newswires survey of analysts. Gasoline stockpiles are expected to grow by 1.3 million barrels and distillates, which include heating oil and diesel, are seen growing by 500,000 barrels. Refinery use is expected to grow by 0.1 percentage point to 89.5% of capacity. Prices rose earlier as the dollar weakened ahead of Tuesday’s Federal Reserve meeting and as fog in the Houston ship channel blocked crude oil imports. Still, fog in the channel helped a huge drawdown in U.S. stockpiles in the week ended Nov. 30 and some analysts are expecting increased deliveries made last week to make up for that fog to help boost stockpiles in data due Wednesday. Trading has been choppy amid low volumes ahead of Tuesday’s Federal Reserve meeting, which is widely expected to deliver a 25 basis-point cut in interest rates. Still, some analysts say a bigger-than-expected cut in rates, while hurting the dollar, may not necessarily support crude oil. “We feel that any rally back to around today’s highs will be viewed as a selling opportunity since a large rate cut may be interpreted as indicative of a weaker-than- expected economy,” said Jim Ritterbusch, of trading advisory firm Ritterbusch and Associates, in a research note. The Houston ship channel, which serves five crude oil refineries, was shut due to fog early Saturday and remained closed Monday morning, a dispatcher with the Houston Pilots Association said. Oil prices were choppy last week amid low trading volumes, as the market searched for direction after a more than 10% slip from the all-time intraday high of $99.29 a barrel reached Nov. 29. The low volumes, with analysts speculating many funds have finished their trading for the year, provided for big swings in both directions on different days. Many analysts are tipping crude oil to trade in a range between $85 and $91 a barrel until the end of the year. Traders are focusing heavily on winter demand, and sustained cold weather could provide additional gains. This is looking unlikely, however, with forecasters predicting mild winters in both Europe and the U.S. In the medium term, the U.S. National Weather Service is predicting warmer-than-normal weather from Dec. 17 to Dec. 23 in the Northeast, the world’s biggest heating oil market. Front-month January reformulated gasoline blendstock, or RBOB, fell 1.89 cents, or 0.8%, to $2.2501 a gallon. January heating oil fell 2.73 cents, or 1.1%, to $2.4774 a gallon.